It was 4 o’clock. One hour to church. Our daughter is visiting her grandmother, so we call and ask if she wants to come to church or wants to stay longer. She wants to come to church. Half an hour later, she comes home. As soon as she walks through the door she tells me she has something to show me. She tells me to go to the other room and asks her mother to come help her. Two minutes later she bursts through the door as Darth Vader. I laugh approvingly and tell her how cool she looks, reciting a line or two from the films. I take the photo above. At this point, we only have a couple of minutes before we have to get into the car for church. I know my daughter. She wants to wear the Darth Vader costume to church. I don’t think that’s a good idea. So I break it to her gently. She freaks out. Falls on the floor crying, super grief mode. I try telling her that she can wear it after church. I try bribing her with candy. Nothing helps. In the end, we agree on a compromise: We’ll bring the costume to church, but in a bag. She won’t be wearing it as we walk in. I just hope she’ll forget about it and not put it on. We arrive at church. She runs off with her friend and I get a moment to think. After the service she comes for the bag. I let her take it upstairs where she puts on the costume. A minute later she enters, a look of pride and serious intent behind the mask. Just like I did at home, I tell her how cool she looks. I tell her how cool she is and I cheer her on. As we walked to the car some ten minutes later, I looked at her, mask off now, but cape flying in the wind. She wasn’t giggling. This was no joke. As far as she was concerned, she was wearing the coolest clothes she owned. She loves Star Wars. It’s something she and I have together. Her mom isn’t a fan and her brother is 1. She is 5 and a massive fan, particularly of Padmé Amidala and Princess Leia. We’ve watched the films together several times (all except Episode 3, which is a bit too dark for her in my estimation). She plays Angry Birds Star Wars on the iPad. She has me print out Star Wars colouring pages all the time. We read the comic books together when she goes to bed. She really, really loves Star Wars. I don’t believe in indulging your kids. I don’t think their every whim should be taken as ontologically significant. But good parents recognise when something is genuinely special and precious to their children, and they nurture that affection, encouraging it to grow in healthy ways. There were two things special and precious to my daughter that night: Star Wars, obviously, but also church. The fact that she wanted to bring the Darth Vader costume to church and to show it off there, says something about how she regards church. Remember how she wanted to go to church, all on her own? That’s special and precious. So is the sense of belonging, of trust and of genuinely positive relation that lies behind a wish to show off your best clothes to the people at church. I think it’s somewhat important to wear nice clothes to church and we usually do. I wouldn’t approve of a grown man, for example, donning full Stormtrooper garb in church. It would feel disrespectful. But to me, facilitating the connection to church I could see in my daughter’s wish not only to be there, but also show off her cool new costume, is much more important than teaching my daughter a lesson about respectability. We can do that later. Right now, I want her to know and to feel that church is good. That church approves of her. That church loves her. Knowing that will help her through some dark times when she gets older. When she feels alienated by church, she’ll have this positive memory to hold on to. When other Christians treat her badly, she’ll remember the ones who treated her well. When she doubts her faith, the love and acceptance she felt from the Christians in her childhood will put intellectual questions in their right place in the larger context of loving God and loving neighbour. She’ll know what to look for in a church. And she’ll know how to be in church. My number one duty as a Christian parent is to model the love of Christ in the lives of my children. To ensure that the love of Christ isn’t an abstract dogma, but something they’ve experienced tangibly and can put their finger on. 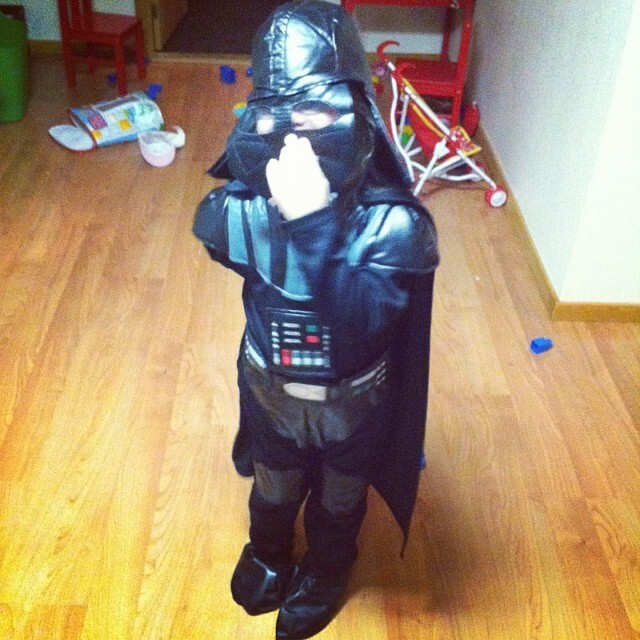 I hope that’s what I did yesterday when I let my daughter wear her Darth Vader costume to church.